The main quadrangle at Stanford University seems at once a classic academic setting and a place rooted in its California context. These two responses to the design are a clear indication of the successful blending of ideas that began the university. Leland Stanford was a successful California businessman and politician; his wife Jane was an equal partner in creating the university they named after their late son. They hired the top designers of the day to create their campus. Frederick Law Olmsted is often considered the father of landscape architecture and designed New York’s Central Park and Boston’s chain of parks known as the Emerald Necklace. Charles Allerton Coolidge was less well-known but his firm Shepley, Rutan & Coolidge was the successor to H. H. Richardson’s firm and carried on the architectural traditions reflected in landmarks such as Boston’s Trinity Church. During the university’s design, these strong-willed individuals clashed as they created a new sort of university in a new community and region. Olmsted would have located the campus on a small knoll in the foothills; Coolidge oriented the quad so the vista along Memorial Drive was open to the hills. The Stanfords overruled them on both counts and created a monumental quad with room for expansion around it. They organized a university that was co-ed when it opened in 1891 and combined classical study with practical training. Its surroundings were agricultural; even San Francisco (about 40 miles to the north) had only about 300,000 residents at the time. 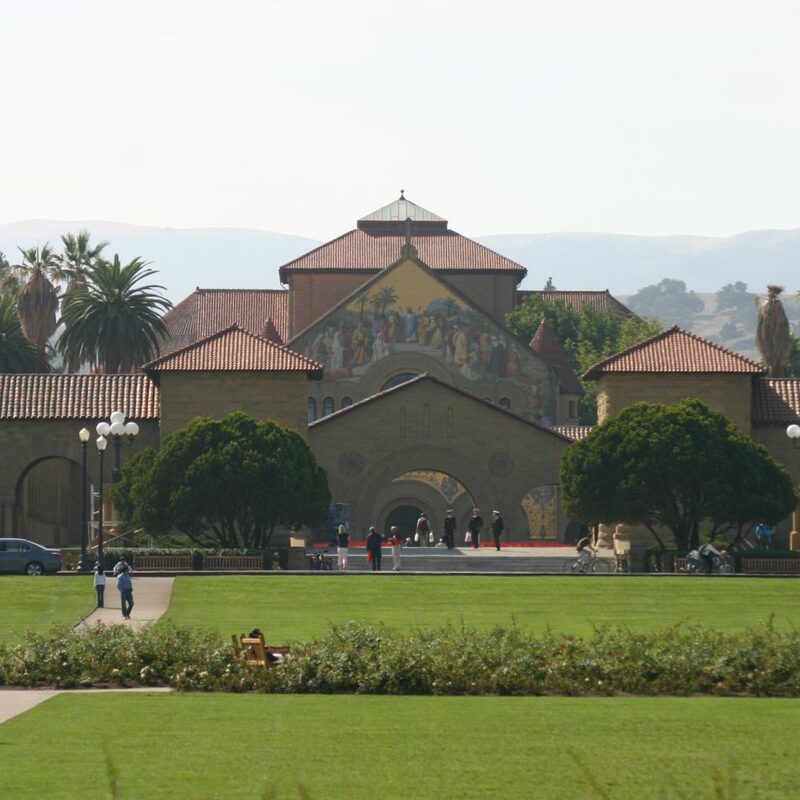 I returned to the Stanford campus last fall for my class reunion. Walking around the campus reminded me how well its design has served its intended purposes. The Quad is still Stanford’s center, even though many newer buildings fill the area surrounding it. The monumental design is both inspiring and accessible, a beautiful backdrop to the candlelight dinner held for the alumni and the horde of bicyclists that descend on it between classes. Even in the midst of campus, the foothills are visible and landscaping connects the campus – now in the midst of a major urban area – to the natural setting of the foothills and San Francisco Bay. There are places for quiet study and conversation in the oldest parts of the Quad and in the new centers for specialties that didn’t exist when I was there (much less when the Quad was completed). There is a dense network of pedestrian and bike routes that make walking and biking more convenient and faster than driving (and parking) a car. There is beauty in the juxtaposition of the Romanesque architecture of the older buildings and the dramatic contemporary architecture of new ones. And there are many gathering places, large and small, that seem to be constantly used by clubs, advocacy organizations and informal groups of friends and colleagues. It’s certainly true that a university is a unique sort of community because so many of its residents are pursuing similar objectives and its development decision-making process is far more centralized than in a city with thousands of individual property owners. Still, the design choices made at Stanford during the decades of its development have created a physical place – and a community – that support individuals, cause interaction with a diverse variety of people and ideas, encourage exploration, are constantly changing and yet provide the landmarks that connect each individual’s experiences with those of other people who have and will spend time here. This campus illustrates the concepts that truly define a lively and livable community.